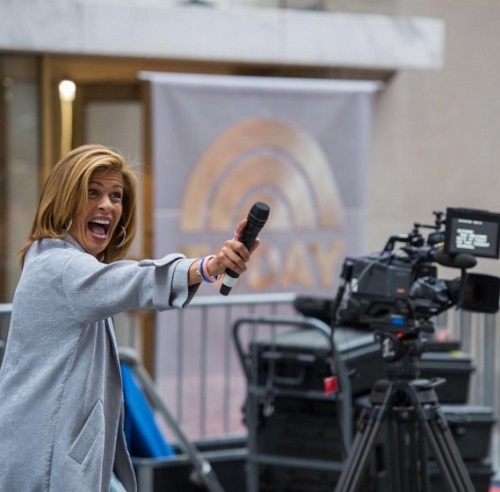 Kathie Lee and Hoda Kotb Feuding On ‘Today’ Show Set? “Today” hosts Kathie Lee Gifford and Hoda Kotb look like the best of friends on air, but it is apparently just an act for the cameras. According to a new report, the two are embroiled in a feud and have even stopped speaking to each other when off-air. Supposedly, things are so bad that Hoda has moved dressing rooms to avoid Kathie Lee. This is a far cry from how things used to be for the pair who would hang out in each other’s rooms. A source claims, “Their doors were always open and they would run back and forth. It was like one big room that they shared away from all the other hosts.” But, Hoda has now moved her dressing room to a different floor, which will no doubt help her to avoid any awkward hallway run-ins with Kathie Lee. So, what caused this feud between the perky talk show hosts and former best friends? Perhaps Kathie Lee is feeling a little left out of Hoda’s life these days. The two would spend a ton of time together outside of work. They would often go to the theatre or for dinner and drinks, and Hoda was one of the people Kathie Lee leaned on after the death of her beloved husband, Frank Gifford in 2015. However, times have changed. Now days, Hoda is a new mom to a three month old daughter, Haley Joy, whom she recently adopted, and of course being the mother of a newborn takes up most of Hoda’s time outside of work. Hoda also recently moved in with her boyfriend of three years, Joel Schiffman and having a new family means there is no time for Kathie Lee. Another point of contention for the duo is Hoda’s burgeoning friendship with new anchor, Megyn Kelly. It is no secret that the decision to hire Megyn has been controversial and has ruffled many feathers among the anchors at NBC. It was previously reported that some anchors, like Tamron Hall for example, were pushed out to make room for Megyn. Tamron was extremely popular, not only with the audience, but other NBC hosts as well. This has caused multiple feuds with people taking sides and either being for or against Megyn. Hoda apparently likes Megyn and the two have been spending time together which is not sitting well with Kathie Lee. Check back with CDL for more Hoda Kotb and Kathie Lee Gifford news and updates here. @rascalflatts gave @hodakotb a gift for #HaleyJoy (and yes we’re crying)! Taylor Swift, Katy Perry Feud: Dating 1D’s Harry Styles Makes Taylor’s Blood Boil! Zayn Malik Disses Perrie Edwards and Little Mix On Twitter – Former One Direction Singer Hates Ex-Girlfriend? Maddie Ziegler Quits ‘Dance Moms’ – Strained Relationship With Abby Lee Miller? Jennifer Garner Pregnant: Having Fourth Child With Ben Affleck To Save Marriage?